Looking to find out where the Tahoe City Home Values are at for 2017? Wondering if now is the time to buy, or sell a home or condo in Tahoe City, CA area? The Tahoe City real estate market conditions continue to change; and prices have moved up for sellers. Tahoe City Home Buyers have fewer choices, and for those looking for a home for sale in Tahoe City under $600,000 will find their options are very limited these days. As an example of how limited the selection of lower-priced homes are as of 09-05-2017 there were only four (4) homes for sale in the greater Tahoe City area, and one of those properties is a cabin on government leased land. That leaves only three homes that are available under $600,000 that a Tahoe City home buyer has as an option where they would own the home and land. Tahoe City single family home prices are down slightly for 2017 when compared to 2016. Since the entire North Shore, West Shore, and greater Tahoe City area is up 11.7%, This slight decline is most likely because we have not have any Tahoe City lakefront home sales close so far in 2017, which could be impacting the median average sales price. Historically between the 4th of July through the Labor Day period is when we see our inventory levels balloon and peak for the Tahoe City single family homes sales in our area. This year, we have not seen those levels move to an over-supply level and this unseasonably low home inventory level will help keep prices up. At the lower price points Tahoe City home Buyers are often facing multiple offer situations and very few homes options. 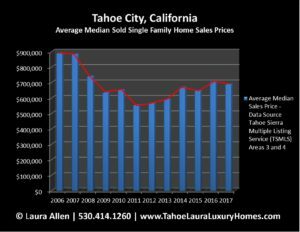 The list to price average for the median sales price in Tahoe City has also moved up to 100.1% of the listed sales price, which tells buyers properties are moving quickly and they need to be prepared to make a decision and to make an offer at, or above listed price for newly listed properties. The days on market (DOM) has also dropped significantly, almost 50%, from 90 DOM at this time last year, to 52 DOM for 2017. What is my home worth in Tahoe City? Want more long-term Tahoe City real estate data? Call me. Even though the North Lake Tahoe – Truckee area has seen prices move up, Buyers seeking the Tahoe lifestyle are still finding the Tahoe City area very desirable, and currently has some of the most impressive lakefront homes for sale currently on the market. See all Tahoe City Lakefront homes for Sale here! The demand for luxury mountain homes in the Tahoe City community continues to be strong because of the extensive Tahoe lifestyle recreational activities this area offers. The Tahoe City community is a very popular area and is easy to get to on a year-around basis. What is my home worth in Tahoe City? As a home owner if you’re asking yourself this question and you want to know your current value, just click on the link below. You will be asked to provide us with some information on your Tahoe City property and I will get you a complete home market valuation report. We know that each Tahoe City property is unique and that it was built as a custom home, or cabin. It’s important that your mountain property gets all of the credit and value it deserves for all of those special features before we place a value on it. When you’re ready to buy, or sell in the Tahoe City home market, call Laura Allen, 530.414.1260, with Coldwell Banker a top real estate brokerage in the Lake Tahoe – Truckee region!